Need Help With Daughter's Bedroom Paint Color! We are remodeling our home and building a bedroom upstairs for our 8 year old daughter. I need help finding the right paint color for her room. 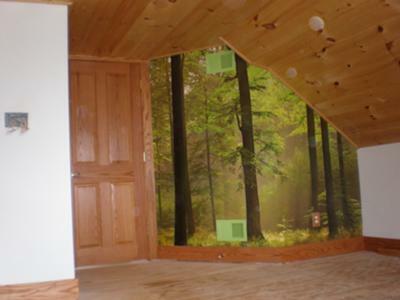 We put up a forest wallpaper mural on one wall and the room gets medium to low natural light from a big window on the north wall. The ceiling is natural pine and the trim is all medium stained oak. The mural has a misty background that is mostly green with a grayish tone to it, but a slight brownish hue in a bit of the background. The photo is off in color and the misty background looks much more beige (brown) in the photo than it actually is. The heat registers on the mural wall are the wrong color and will be changed. I am having trouble picking a paint color that works with the mural and the pine. I was looking at green, but I think I have given up on green? And I’m looking now for a medium-light brown, maybe with a very slight grayish tone to it? I'm really not sure. Any browns with an undertone of green tend to look muddy (I think) and just light brown (beige) isn't quite right. My daughter keeps changing her mind and can't pick a color. She told me to just pick one and get it done. I know she does not want anything too bright or anything that looks like a child's room (too babyish). I've gotten so many suggestions of different greens and beiges that I am completely overwelmed. I think it needs to be a fairly light color, just not too bright or too washed out or dull (does that make sense???). A slight bit of a warmth to it might be nice?? It not only has to go with the mural and pine, but also with my daughter's log bed, which has a medium coloring to it (we varnished it and it brought out the reddish and yellowish-mostly red hues in the wood). We will pick a neutral lighter color carpet after painting. Also, her room is right off the office area which is an orange color (a bit darker than pumpkin orange), so it should probably be something that won't clash with the office color?? Should it be a really soft color or not so light??? Green????? Brown (beige)?? 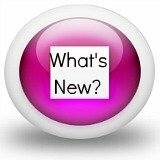 I am looking at Behr, Sherwin-Williams and Martha Stewart paints. I have gotten several samples, put them on poster board and looked at them on the different walls in different light, and still have no idea. I would like to paint as soon as possible, since I've been trying to find a paint color for almost a year now. Any suggestions of an exact color or two to look at would be greatly appreciated! 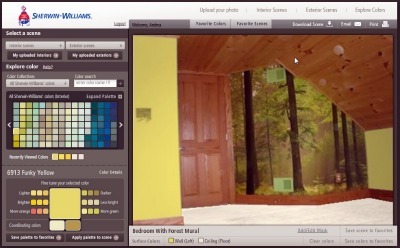 One of my favourite tools is the Sherwin-Williams Color Visualizer. I uploaded your photo and played around with a few colour options to see what worked out best. You can, of course, do this yourself if you want to see how your room would look with other colours. What I decided on in the end was 'Funky Yellow'. Although it is yellow, Sherwin-Williams list it in their green family suggesting it is a green based yellow rather than an orange based yellow. I think it brings out the greeny-yellow in the mural very nicely and will add warmth to the room. Yellow is always a good colour for a bedroom and hopefully your daughter will see this as a grown-up shade of yellow as opposed to a brighter shade which she may have seen as too babyish. It is yellow enough that it won't be too jarring next to the orange of the office next door. Comments for Need Help With Daughter's Bedroom Paint Color! I have tried the Sherwin-Williams site and still cannot find a color. I think Funky Yellow may be too bright and too yellow. I'm really looking for a mush more relaxing (not boring) green or if I can't find a green, then a light brown/beige. Any other suggestions from SW or Behr or Martha Stewart or Glidden or even Pittsburgh Paints? 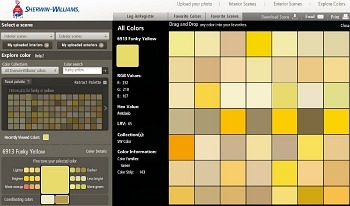 From the main Sherwin-Williams Color Visualizer page, click on Explore Today's Colors. In the Color Search box, type Funky Yellow and click on the arrow to enter. This will give you Funky Yellow and a whole load of other similar colors. Hover over the colors until you locate Funky Yellow and click on it. Do you still think it is too bright and too yellow? If so, it will have added Funky Yellow to the panel in the bottom left-hand corner and you have the option to make it less bright - giving you Chartreuse for one shade less bright and Lucent Yellow for two shades - or more green which gives you Fun Yellow with one shade greener and Frolic for two shades. Hopefully, one of these will be more like the color you are looking for. Join in and write your own page! It's easy to do. How? Simply click here to return to Decorating A Bedroom.